I've been doing these annual look backs since 2007 (2006 was the only year I didn't do one). They've always been a comfort because I always feel like my year has been empty until I go back and read what I actually did. This has been a good year I think. Not spectacular but not bad either. The year came to an end, for me, when I returned from my second Camino. I've been a major homebody since then. Staying home is how I handle the 'in between' times. January: No resolutions or goals were set after missing last year's goals so miserably. A picture of a sad star brought on the most comments I've had in a long time. I bought some new shoes for my upcoming Camino and I gave an email interview to a local newspaper. I ranted about an $0.82 cable and Best Buy. I walked Indian Cave State Park using walking poles for the first time. I participated in a Camino Conversation at a local outdoors store - a fun night of reminiscing and helping future pilgrims. The month ended with an ice fishing trip to lake Cornelia. March: I was unsuccessful in finding a Camino group. My hikes were a mix of too much cold wind, closed parks, and urban decay. The TSA announced changes to their rules on knives and trekking poles - a good thing for my Camino planning (the rules would got back to what they were later in the year). I found out about the loss of a good friend RSS service. We curled for the third time. 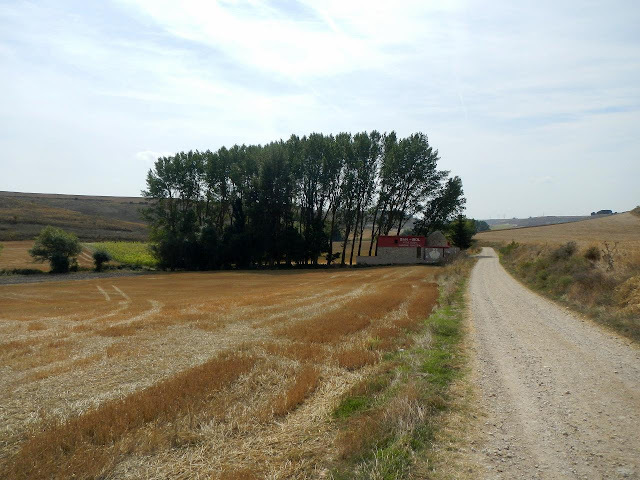 I started the planning of my 2013 Camino by posting the proposed stages. April: The month started on a sad note with the passing of my uncle. I began training with a pack. I decided to set some definite goals, with dates, including when I was doing RAGBRAI and the Appalachian Trail. The last week of this month was filled with four hikes and a second Camino conversation. May: I started this month with fewer hikes, the opposite of how I ended April. It also snowed during the first few days of the month - a rather depressing occurrence. The colder than normal weather didn't help when we lost at bocce in Sioux City. I experimented and took strides toward happy hiking feet. I bought a new set of trekking poles which I am happy with. I saw Star Trek ... and moved on. The month ended with me avoiding mud and rain ... and being disappointed that I avoided mud and rain. The month also showcased a budding poet with two of her poem about walking and blisters. June: In June I decided to try to post more on Homer's Travels and less on Facebook and Twitter (despite the fact that I really don't post much on Facebook and Twitter). Iago chased birds. I returned to Boyer Chute and saw how the 2011 Missouri river floods had changed the landscape. I binged on Doctor Who. We left on our awesome summer vacation to New Orleans (documented in Homer's Travels in July) and places in between. July: July started off with the bang of fireworks - the most I've seen in a long time - and a visit to the In-Laws's lake house. Our anniversary was celebrated in the hospital for routine tests. My 50th Birthday was celebrated at a cousin's wedding followed by a relaxing lake kayaking trip. I crossed the 500 mile walking goal I'd set for myself earlier in the year. I revised my Camino packing list using the lessons I learned on my last Camino. August: My second Camino became real for me starting this month. I started to have weird anxiety dreams. I had one last training hike which resulted in an undesirable itching sensation. 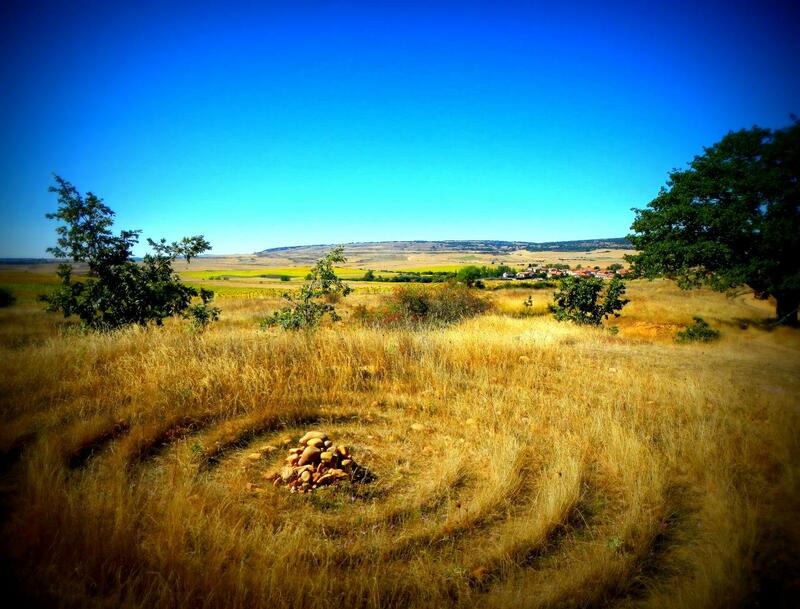 I looked forward to all the new experiences on my second Camino. September: My nerves body slammed me only a few days before the start of my Second Camino. I started walking my second Camino early in September placing Homer's Travels in hiatus. 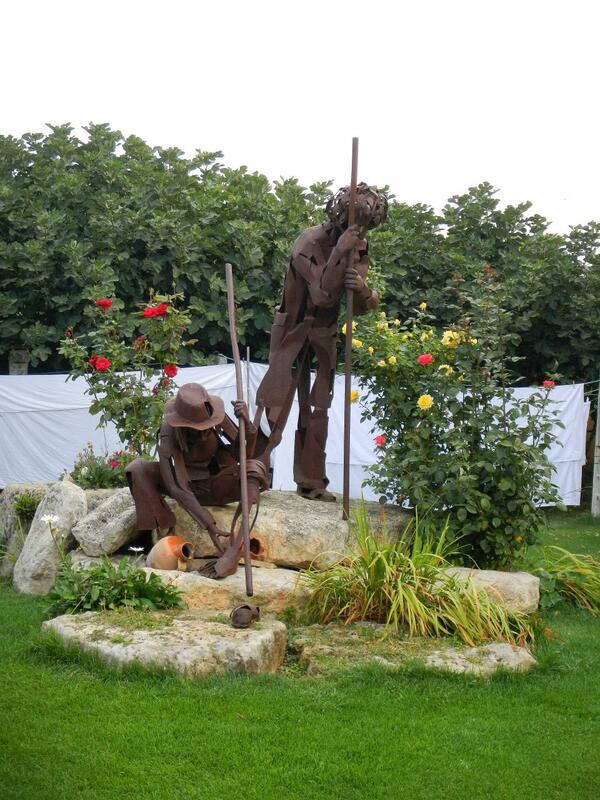 I walked from Oloron - Ste Marie, France to Reliegos, Spain. October: I walked from Reliegos, Spain to Fisterra and Muxia on the Atlantic coast of Spain completing my second Camino. I returned after a very successful Camino. Physically I was in great shape and I didn't return with any major problems like I did last Camino. 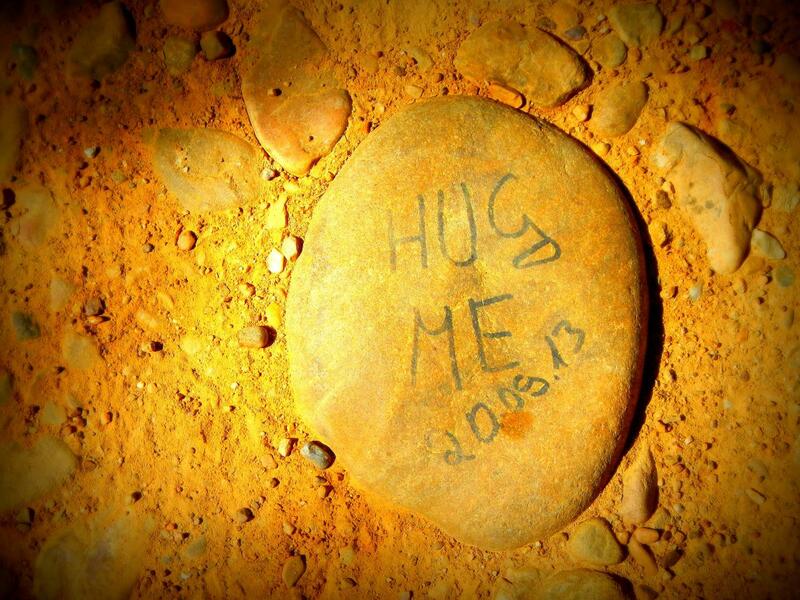 November: I spent most of November going through pictures and writing Homer's Travels' posts documenting my 2013 Camino. I started riding bike again and slowly started to think about preparation for RAGBRAI in 2015. I also dipped my toe every so slightly into the Appalachian Trail preparation. December: This month was, like last month, very low key. I bought a bike trainer so I could continue by bicycle training in the house when it's too cold outside. The Christmas spirit didn't stop at our house this year and only minimal decorations were put up. I received my first piece of camping gear for Christmas - the Tarptent Notch. This year I broke my personal record for miles hiked in a year. 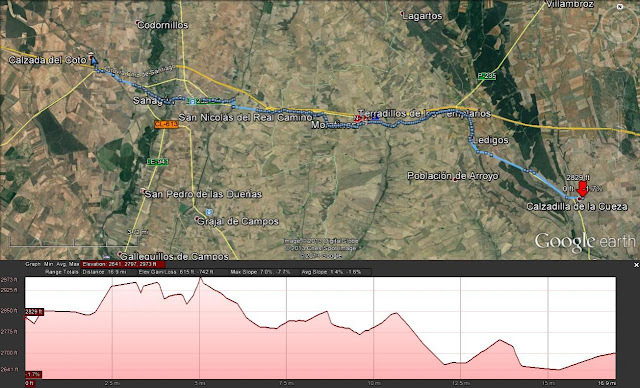 Totaling the Camino training hikes as well as the actual Camino hiking, I nearly reached 1,232 miles (1982.7 km). This was over twice the distance of the year before and over one and a half time my previous personal best (2011). To top it off, I walked all these miles with minimal foot/leg issues. I kind of fell down on the biking front totaling only 48.5 miles (78 km) this year. I have biked 108.2 miles (174.13 km) on my trainer in the last month as well. I wish I'd restarted in the spring like I'd planned - probably would have helped my hill climbing on the Camino. I'll need to get my act together if I'm going to be ready for RAGBRAI in 2015. I've read zero books this year. Well, that's not totally true as I did read the GodSon's book so I guess I really read one book this year. Most of my reading time was spent on Wired and National Geographic magazines and articles on the internet. I'm not sure I really liked not reading so I think 2014 will have to include some reading time. In 2012 we went to no concerts. This year I went to four concerts: Edward Sharpe and the Magnetic Zeros with the Giving Tree Band, Billy Idol, Steely Dan with Deep Blue Organ Trio, and Peter Frampton's Guitar Circus featuring Sonny Landreth, B.B. King, Larry Carlton, and Rick Nielsen. All of them were great. There were a few others I could have gone to, it was a very good year for concerts, but I limited my selection. I posted 116 times this year. Only one more than last year. 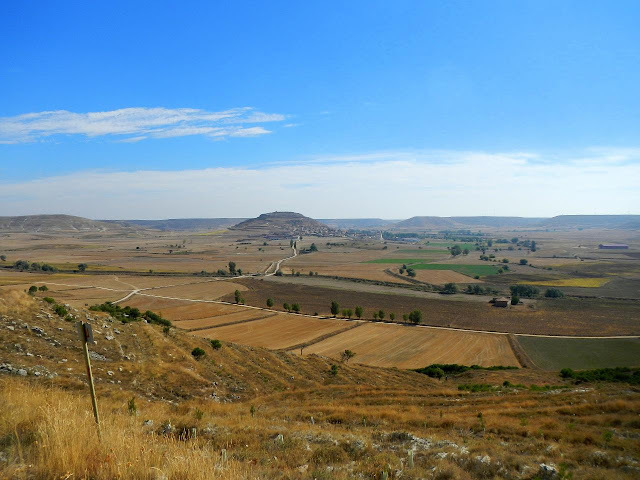 Since I got back from the Camino all my posts have been Camino related and I have struggled to think of any non-Camino subjects to post about. I will try to change this next year. I feel like 2013 started slow (the low number of posts says a lot I think), peaked in September and October when I was on the Camino, and has faded, along with my holiday spirit, over the last two months ending with a whimper. I suppose this is to be expected. I had a lot of 'down' time after my first Camino as well but it was tempered by the sense of euphoria I had after completing the CAmino and Route 66. The Camino glow I felt so strongly in 2011 hasn't been there this time leaving just a sense of blah. I think part of me is in mourning. The Camino is truly behind me now. I have lived it so much the past three or four years that I think its completion is leaving a hole. But it's time to move on to the next goal. RAGBRAI will be here before I know it and I have a lot of training to do. I have to teach myself the ins and outs of camping both for RAGBRAI and the Appalachian Trail. We all need things to look forward to and goals to plan for. I will be finished posting about the Camino in a month or two. Then I can put it in the past once and for all and start moving full speed ahead. This walking day was a mix of dreary overcast and drizzle. It didn't help my mood much. I don't think we saw the sun all day. Pilgrim art along the Camino. We stopped at the albergue I stayed in last time in Terradillos de los Templarios. We bought something to drink and asked if the store in the albergue was open. The hospitalera stopped her cleaning and unlocked the store for us and we bought some apples and other walking food. I remember the hospitalera being very nice and opening the store for us reinforces the memory. As we were were leaving town I was telling Gv about a bad mood outburst I'd had last Camino and how something along the Camino snapped me out of it. A girl, Hn, overheard me talking and told us her story. She said she had been in a bad mood and had had an imaginary argument with her father that had really pissed her off and sent her into in a bad mood. Just then she sees graffiti scrawled on a sign that says "[Hn], walk it off." It completely snapped her out of her mood. The Camino strikes again. The Virgin of the Bridge church and bridge. The Camino take a short detour to the small church near a bridge. Since the last time I was there the restoration of the church had been completed and a pair of columns/statues had been erected indicating the geographic half way point of the Camino. I'm not sure about this. There are so many official starting points and so many variations on the route I think it is impossible to mark a real geographic middle of the way. Geographic middle of the Camino marker outside Sahagún. We stopped in Sahagún for more food and drink and we stopped in a grocery store for more supplies. After Sahagún my energy ran out. 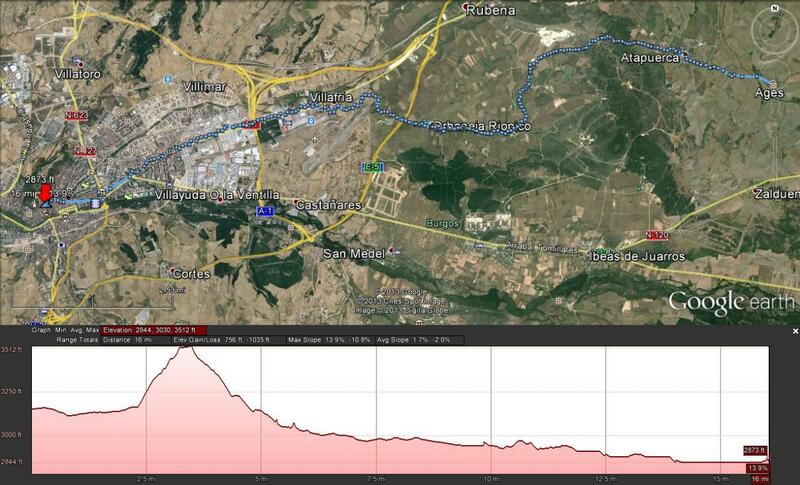 The next 5 kilometers (3.1 miles) felt unending and I was really happy when we reached Calzada del Coto. I'd walked without the gel heel pads that I'd worn since Grañon. My feet hurt a bit but not nearly as bad as before. I wouldn't need the pads for the rest of the Camino. We walked into town. We stopped at a park where other pilgrims were resting. We looked around to see a sign for the albergue. There was a building on one side of the park that looked like a public restroom/athletic gear building for the park. We approached it and Gv noticed a key in the door. She turned the key and opened the door to a tiny little albergue. There were two full bathrooms (men's and women's) and two rooms with 12 bunk beds each. It was the albergue. There was a donativo box inside the door for donations and an old computer that was no longer plugged in. The tiny albergue in Calzada del Coto. Gv, Js (an Aussie girl who followed us into the albergue), and I inspected the place looking for bedbugs and other nasties but found only clean beds with blankets and two clean bathrooms smelling slightly like cleaner. We dumped our stuff on our bunks (Gv and I were in one room and Js took the other) and headed out to find the local bar - there was a sign in the albergue saying that the local bar had the pilgrim's stamp and was sort of in charge of the albergue. Not sure if our stuff was safe, we locked the door behind us and took the key. The bar was a distance away (there once was a bar across the street from the albergue but it was now looked abandoned). But we found it and had some drinks with Js. She was fun. We would end up walking with her the next couple of days. The bar was the only place open in the town so we ate dinner there as well. I wasn't too hungry so I just settled for a large salad and some hot chocolate. Just outside of Calzada del Coto the Camino splits in two paths. One is the original Camino that goes through Calzada del Coto. The other was added during the last holy year (2010) to handle the larger load of pilgrims and goes through Bercianos del Real Camino. It seems that most people, including myself last time, take this newer path. This night there would only be the three of us in the albergue. All the pilgrims we saw resting outside in the park before had moved on to the next town. It was a weird experience but a nice change from the crowded albergue we'd been in the night before. We locked the albergue from the inside, plugged in the electric heater briefly to help get rid of the damp (the rain and drizzle made everything feel damp), and had a great night's sleep. We left Villamentero de Campos in a light drizzle. It was overcast and still dark. As we left the small town the bicycle pilgrim passed us ringing his bell. The drizzle was light but steady the next 10 kilometers (6.2 miles) until we reached Carrión de los Condes. We wandered around the town looking for a place to eat. Things were still closed. We ended up walking back to a bar/cafe near the entrance to the town. The place was full of pilgrims. The bus stop is outside the bar and quite a few were going to take the bus ahead. We talked to a couple of American women who were waiting for the bus. They were going to skip the rest of the meseta. You could tell it was harder than they had expected. They were also put off by the on and off rain/drizzle that had been around the past few days. They looked at me funny when I told them this was my second Camino. I ran into that look a lot on this Camino. This was another change on the Camino. 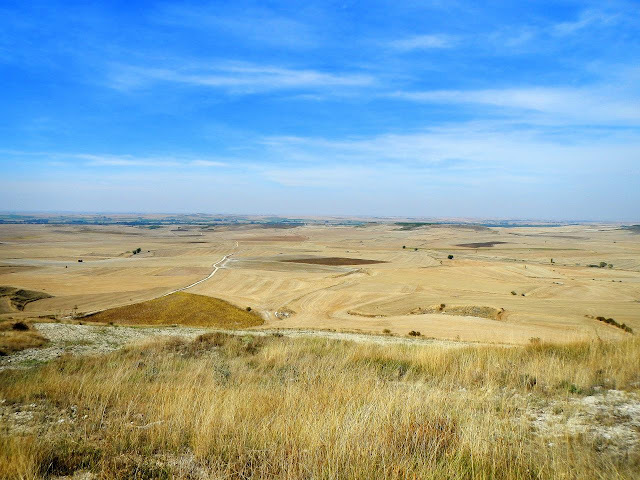 When I'd run into a repeat Camino walker I'd asked about their experience and for their advice. This time, when people found out I was a repeat walker, many would look at me with this pained expression and would ask with an incredulous tone "Why?" The wonder I'd felt my first Camino, even on the hard days, was always a rare commodity this time. Fortunately there were still people walking who did appreciate it - they balanced all the people who didn't get it. 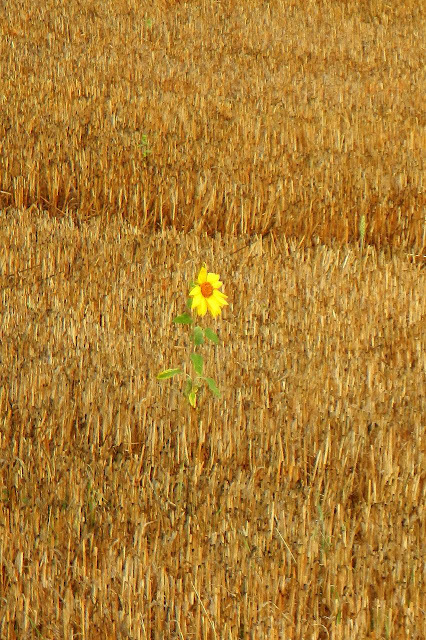 Solitary flower in a harvested field. We ate some food, said our goodbyes to the ladies, and headed out into what was now a steady rain. We stopped at a grocery store and picked up some supplies and then headed out of town. 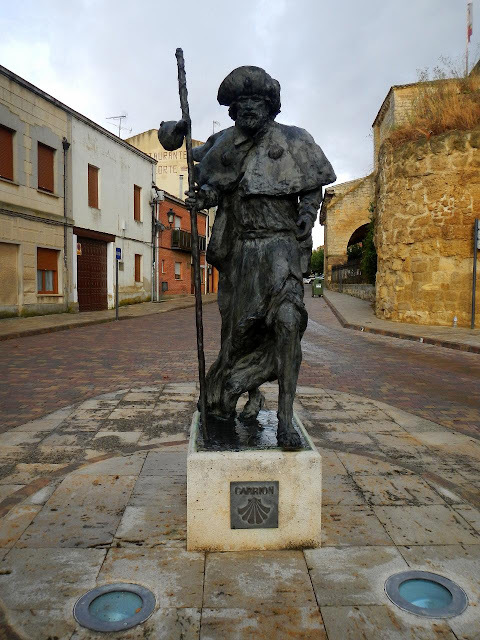 Pilgrim statue in Carrión de los Condes. The rain was constant. 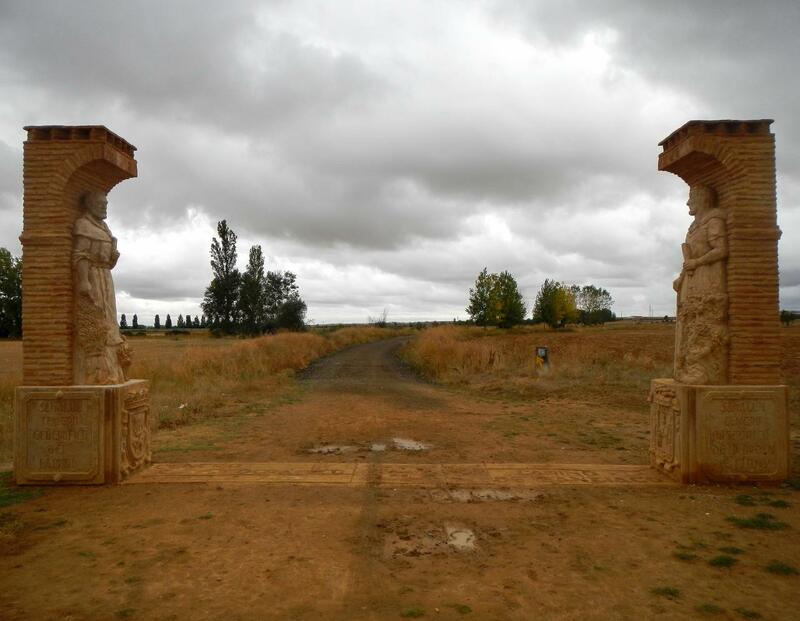 This section between Carrión de los Condes to Calzadilla de la Cueza is one of the longest sections between towns - about 17 kilometers (10.6 miles). 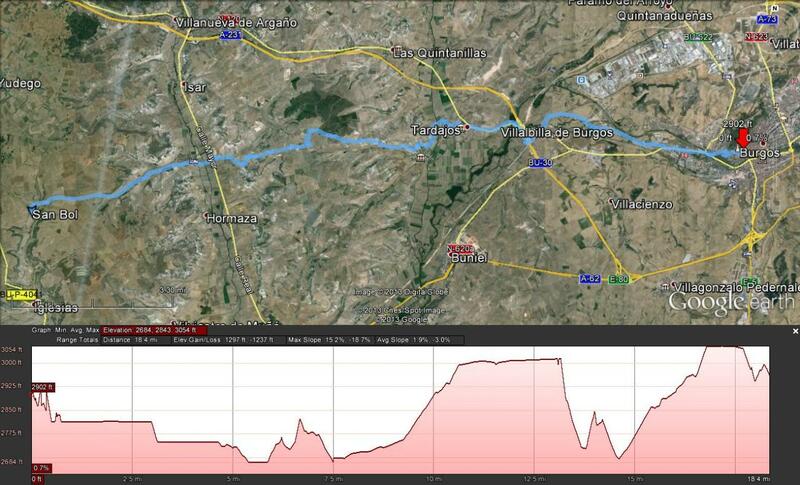 It is relatively flat and straight though there are still some low hills on the section. It follows the original Camino ... the Camino has changed a lot over the centuries. The overcast skies, the constant rain, and the cold wind that started to blow crushed my spirit. Last time this section had been one of my favorite parts and I told this to people when they asked what part I'd liked the most. It encouraged a walking meditation with no distractions. This time it was just demoralizing. We met Ma, Cm, and Ci who we had met at San Bol and we walked with them for a while. Ci turned out to be a fast walker and it was hard to keep up with her but the conversation did help lift my spirits a bit or at least distract me from the rain. 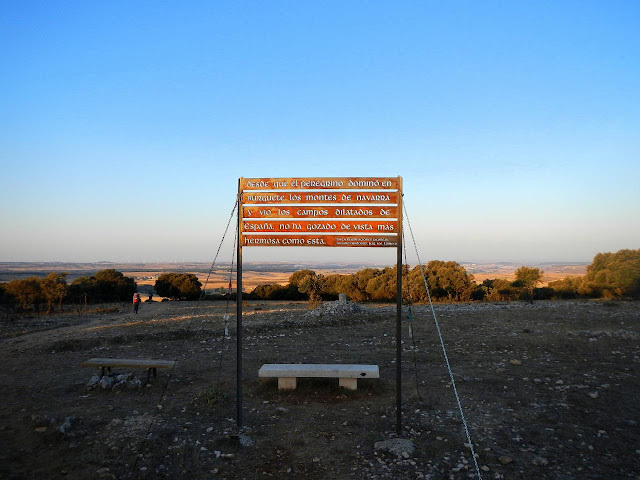 There is a rest stop about two thirds of the way to Calzadilla de la Cueza. We stopped and snacked a little to get our energy back up. Either Ci or I said something funny as Gv was drinking orange juice. Not good. I saw the orange juice come out of her nose. Orange juice in your sinuses ... not a nice feeling. Stuff burns I hear ... or at least that's what Gv said. We tried, unsuccessfully, to not laugh at Gv's distress. The last third of the way the rain began to diminish a little. There was a guy way ahead of us and a couple behind us. I noticed the guy raise his hands over his head and turn and wave at us. I wasn't sure what he was doing until I reached the top of the hill. From the top of the hill you could see the town in a depression (you couldn't see it until you were nearly on top of it). Both Gv and I cheered. As we went down the hill approaching the town I heard a cheer behind us - the couple behind us had reached the top of the hill. I think that was the reaction from everyone this rainy, dreary day as they saw the town not far ahead. 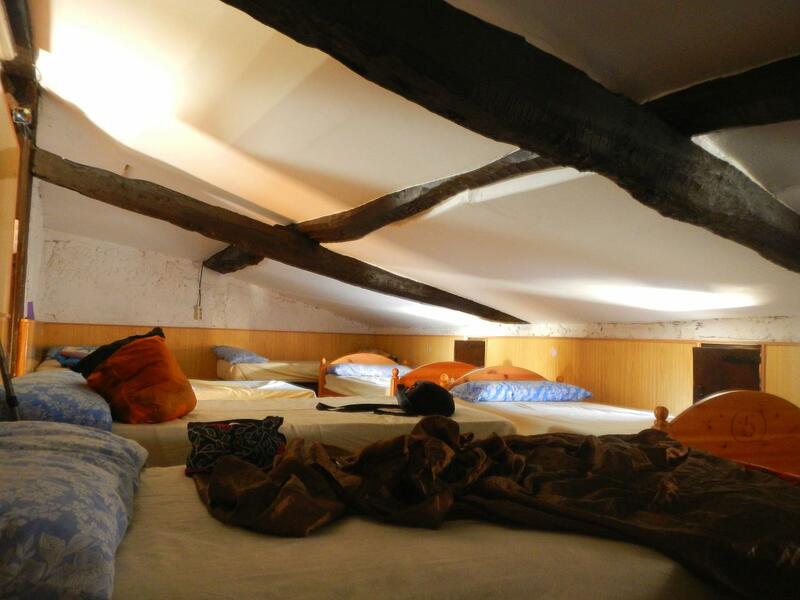 The albergue was a a two story dormitory with tightly packed bunk beds. We ended up next to the hospitalera's bed. The albergue filled up by 3:00PM and people were camping in the backyard including the camping pilgrim with his cute white dog we'd seen in San Bol. I hadn't expected this albergue to be full. Most people start in Carrión de los Condes and pass Calzadilla de la Cueza on the way to Lédigos or Terradillos de Templarios. I think this time the rain and cold wind motivated a lot of people to take a short day. Being gluttons for punishment we had made this a longer day. The drizzle/rain came and went the rest of the evening. We ate lunch and an early dinner in the one restaurant in town. Not wanting to wait for a real dinner we ordered pizza before heading back to the albergue. My heal blister on my right foot got a little worse this day. We still hadn't found an effective way to treat and protect them yet. The blister wouldn't stop me from walking but it would make things a bit uncomfortable over the next few stages. I was happy this rainy, dreary day was over. There would be more rain ahead and more dreariness but this day had been a low for me. I survived physically but emotionally I was tired. It seems I run on sugar and sunlight and, for most of the meseta, I would be sunlight deprived. I took few pictures this stage. The rain discouraged stopping or looking around much. The few I took can be found in my 2013 Camino de Santiago Google Photos album. I have to admit that I haven't been in the Christmas Spirit this year. Both the Wife and I were late giving each other our lists. 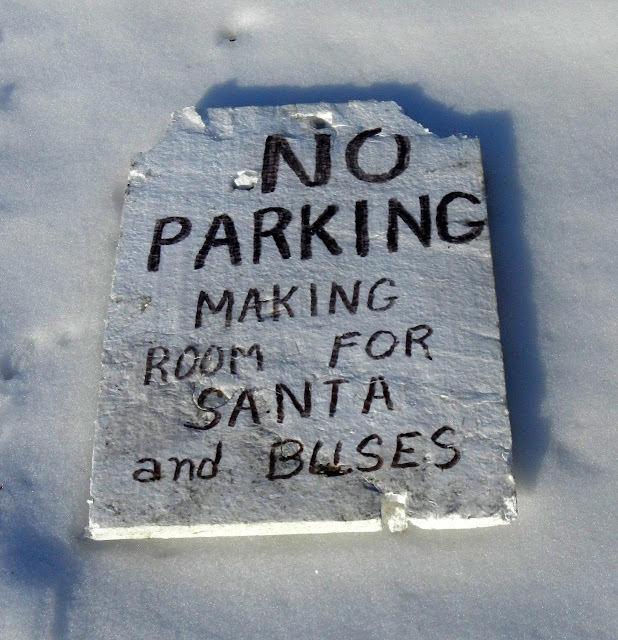 Christmas cards have not been sent. The only decorations up are the lights and wreath outside and the tree with lights inside. No balls in the tree outside. No ornaments on the tree inside. Christmas Music, which usually gets me in the mood, has fallen flat. I just can't get in the mood. For those who sent us Christmas cards, thank you. I will not be sending cards out to friends and family this year. Having said all this, depressing as it sounds, I still want to wish everyone a very Merry Christmas. We left Itero de la Vega early on a sunny day. The weather would change soon. If I'd known that, I would have enjoyed this day more. Then again, I enjoyed this day anyway. Pilgrim sculpture In Boadilla del Camino. The first stop of the day was at the private albergue in Boadilla del Camino. Last Camino I'd stayed at the municipal albergue but I should have stayed here. The place had an impressive courtyard and a friendly staff. Despite them being in the middle of cleaning the albergue the hospitaleros let us use the facilities and we bought some food and a few walking snacks. This town seemed a lot nicer than last time. I think it was because it had been really cold last time. As we were leaving we noticed luggage piled near the door of the albergue. Some pilgrims don't carry their bags and have baggage services transport them to the next albergue. The odd thing is most people still use backpacks even if they use a taxi service but in this pile of luggage there were some hard sided suitcases. They didn't even try to pretend to be traditional pilgrims. Second stop of the day was in Fromista. The approach to the city is nice as the Camino follows a canal used for irrigation. As we got closer to the town you cross a bridge over the canal. As we approached the bridge we noticed a large group of tourists gathered around the narrow foot bridge - many were taking pictures. We reached the edge of the crowd. Someone noticed us and told everyone to make way for the pilgrims. They made way for us and said Buen Camino as we passed. The tourist were taking pictures of a torrent of rushing water filling the canal. Not sure what the attraction was for tourists but they seemed interested in it. 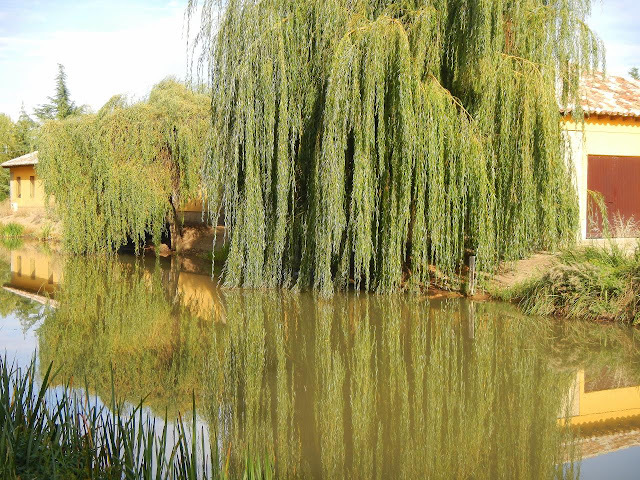 Weeping Willow Reflections near Fromista. We entered town and stopped in a bar/cafe to get some food, drink, and internet. On the way out of town we looked at the street market wares. We were lucky to pass through several towns with their weekly markets going. The way we walked this time was a slight variant from what I took last time. This variant passes through more towns and it was nice to see something different from last time. We ended the walking day in the village of Villarmentero de Campos. The albergue was attached to a bar/cafe - the only source of food in the town I think. The bar was decorated with images of Bob Marley and marijuana leaves. Every square inch of uncovered walls were written on with messages from prior pilgrims. I didn't add to the walls but a few of the other pilgrims did. 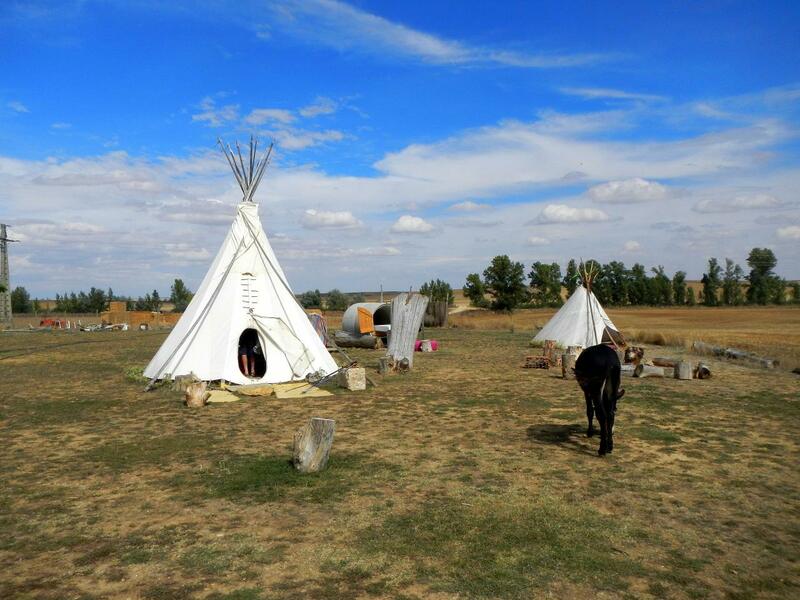 Tepees and a donkey at the albergue in Villarmentero de Campos. The place was interesting. It was located on a plot of land. that was shared with two dogs, two donkeys, and a few chickens. When the fresh bread was delivered, the day old bread was hand fed to the donkeys and dogs by the owner. The albergue had a large garden along one edge. In the middle was a couple of tepees and a couple large concrete pipes that had doors and beds. You could sleep inside the building or you could choose to sleep in a tepee or concrete pipe room. There was a cluster of signs pointing out the highlights on the town - the bathroom, the sunset, the church, and the bar. It was kind of funny - there wasn't much here. The attractions of Villarmentero de Campos. A few people that we'd seen on and off since Grañon showed up - the Polish couple, Tq and Ad, the Austrian woman, Kr, and a young German girl, Ax, who were all walking together. A few other we didn't know arrived as well including a crazy bike pilgrim. 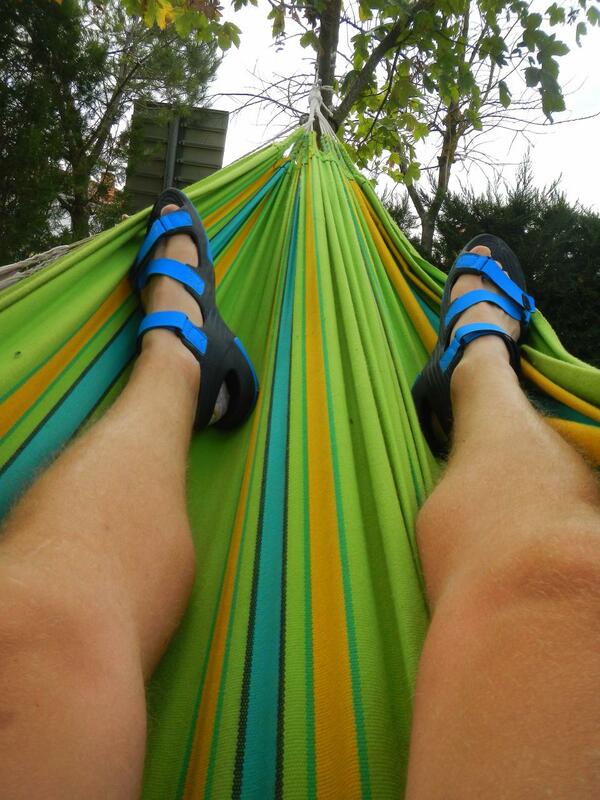 After doing our chores we laid out in hammocks and relaxed in the sun. I discovered I'd developed another heel blister on the other foot. I'd hoped the blisters wouldn't multiply but they did. I put some duct tap in the heel of my shoes in the hope that would reduce the friction. It was a relaxing afternoon. Took my first selfie here (Facebook friends have seen it). We shared a communal vegetarian meal at the bar that night. The food was locally grown food from their garden. It was very good. The conversation was fun as well. The biker guy had just got a divorce and I don't know if he was happy about being single again or missed his wife. He was a bit confused I think. 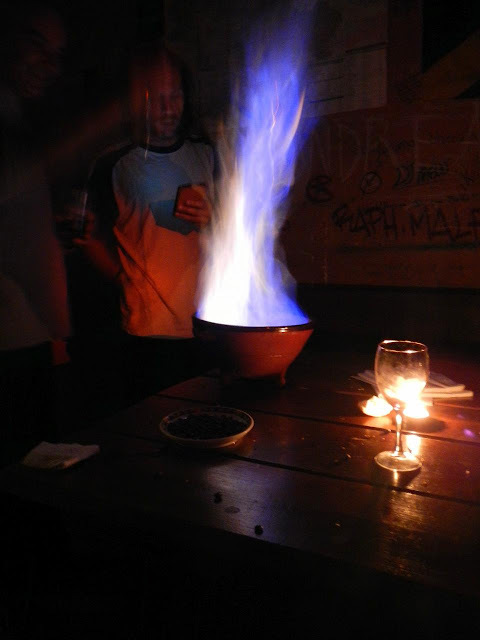 The meal ended with some flaming alcohol ritual which has some connection to magic I believe. Tq, Ad, Kr, and Ax had chosen to stay in a larger Tepee. As it started to get dark the clouds started to roll in, the wind picked up, and it began to rain. It was quite a storm with lightning and thunder. Everyone except Ax moved into the dorms with us. Ax would spend the night in the tepee and said it was quite dry and warm in there once she fell asleep. After the rain started we relaxed inside our dorm common area. The hospitalero started a fire in the fireplace and clothes that weren't dry yet were moved near the fire. People gathered around the fireplace as the bike pilgrim played guitar. A nice evening indeed. Well, this was supposed to be another Camino post but a graduation of a niece, an early Christmas gathering with the In-Laws, and poor time management on my part (compounded by A&E reruns of Criminal Minds) has pushed the next Camino post until at least Tuesday ... I hope. Sorry for the delay and stay warm everybody! We got up early and had some breakfast at San Bol. Another hospitelera had arrived early and prepared coffee and set out a spread of muffins, toast, and pastries - a very typical Spanish breakfast. I asked for a cola cao to drink. I ate my breakfast fairly quick and left my cola cao cup half full. The hot chocolate didn't taste as good as the cup I drank in Villamayor de Monjardín. 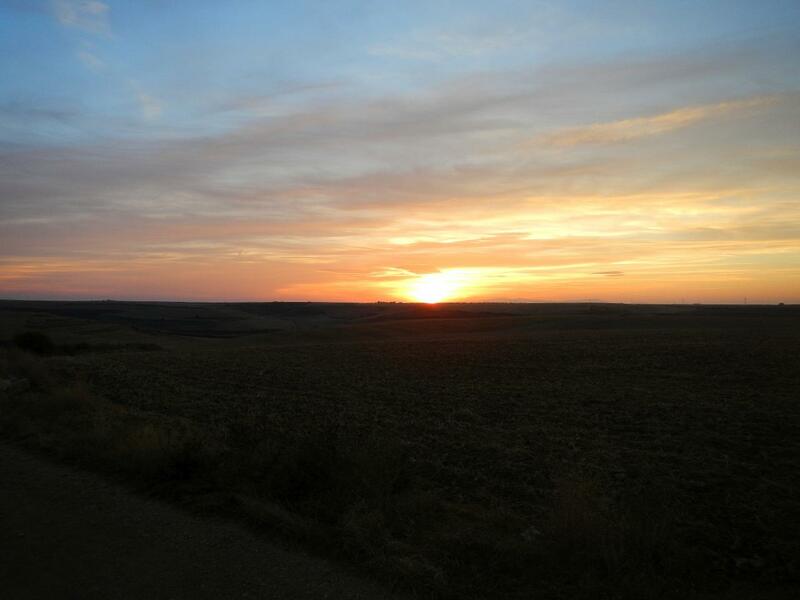 Sun rising on a new day on the meseta. We stopped in Hontanas to use the internet. I'd stayed there last time and there wasn't much there. We ran into a few people we knew here. After Hontanas is the albergue of San Anton. We stopped there to see what the albergue was like. 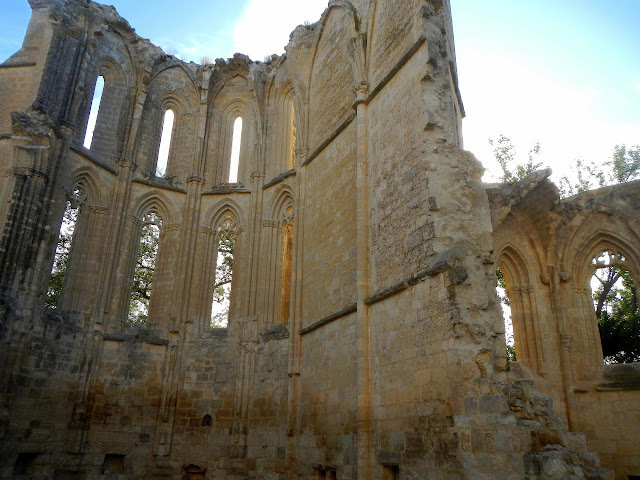 It's located in the ruins of an old monastery. It is very rustic and a few kilometers from the nearest town. When I was planning our itinerary I'd hoped to stay here but it hadn't worked out - too many interesting albergues to stay at in too short of a distance. We got a stamp at the albergue before moving on. The ruins of the San Anton Monastery. We caught up to a few more people we knew in the next town of Castrojeriz. We talked a little as we walked through the town. Gv was talking to an Austrian lady, Kr, we'd encountered on and off since Grañon. She was a very nice lady. Gv asked about a small picture she had on a necklace I believe (the memory is a bit hazy as I was ahead of them while they talked). Kr began to cry. The picture was of her late husband. I'm not sure if this was her reason to walk the Camino, Gv has more of the story, but the motivations to walk the Camino are varied, both happy and sad. Some walk to remember. Some walk to forget. Looking back at Castrojeriz from the top of 'the hill'. We stopped in Castrojeriz to get some food and something to drink before we tackled the hill. The hill is just outside Castrojeriz. 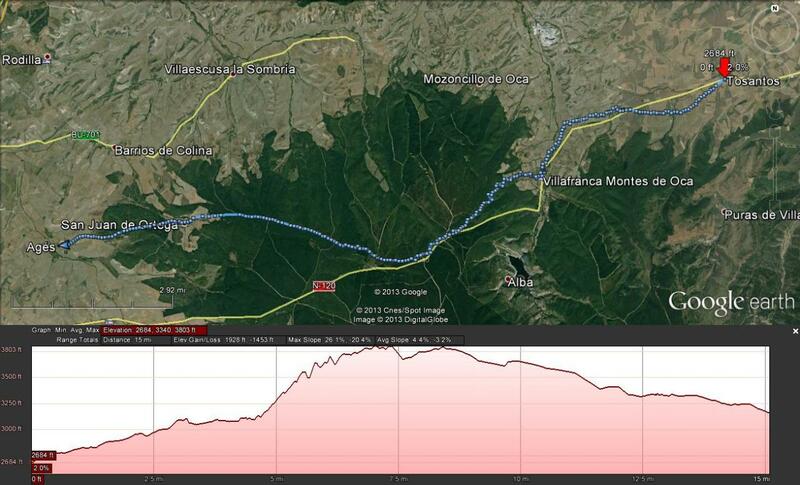 You climb a steep road up, cross a flat stretch, and then go down an even steeper road. This is where the flatter part of the meseta starts though, as I mentioned in an earlier post, the meseta is not really that flat ... at least not as flat as I remembered. The meseta lies before me. What was green last time is now golden brown. The hill was tough and we rested at the top. I hadn't rested last time but I needed it today. We crossed the flat area, which was naturally shorter than I remembered, and, after admiring the view, headed down the hill in a very slow, zigzag pattern to lessen the stress on the knees. Thank heavens for the trekking poles. Our next stop was at a rest stop in the middle of nowhere. I remember the place from last time. There had been a guy selling fruit and drinks. He was still there. He was offering fruits and drink for donations. I took a coke and a banana and left some coins in his cup ('some coins' sounds like a small amount but the Euro, roughly $1.37, are coins and I'm sure I overpaid). 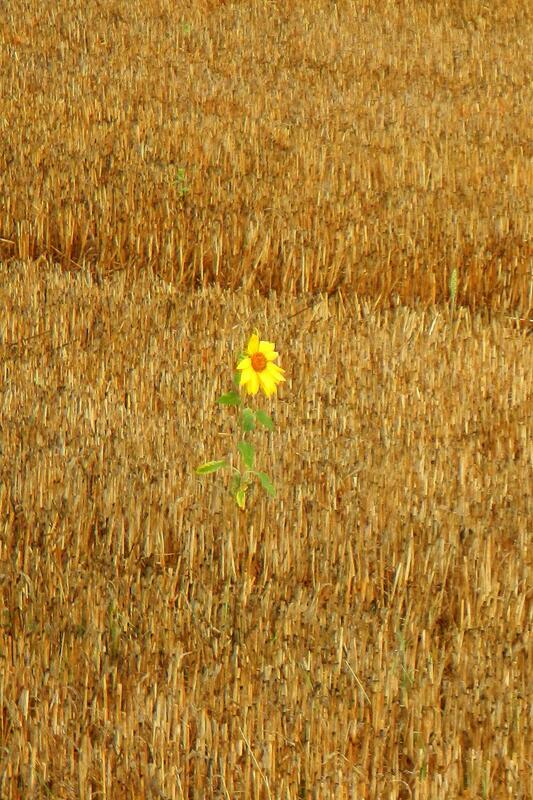 We sat at a picnic table and watched the farmer harvesting sunflower seed in the field next door. At this point we were not far from our destination. I was tired but the caffeine in the coke gave me a little boost and it got me to San Nicolas. San Nicolas is another rustic albergue out on it's own. I'd thought about stopping here but I'd had enough rustic for now. Instead we walked to the nearby town of Itero de la Vega. Itero de la Vega was filling up fast. The first albergue we stopped at was full. The hospitalera strongly suggested we should avoid the municipal albergue (it had a bad reputation apparently) and she took us herself around the corner a block or so down to a new albergue run by her friend (I'm still not sure if the municipal was really that bad and she was doing us a favor or if she was doing her friend a favor and bringing her business). Her friend ran a tiny albergue that held eight to twelve people that felt like someone's home. The beds were two to a room and there were nice big bathrooms with locks on the door - always a bonus in an albergue. We did laundry and bought food in the grocery store next door (also owned by our hospitalera) before walking around the small town. We met a nice Australian couple. They were looking for his sister who was also walking. Soon after we would realize that Ci, who we'd met at San Bol, was the sister. The brother seemed to be having a great time and always had a wide smile on his face. His wife was doing okay but I don't think she was enjoying it as much ... and the eye roll suggested she didn't like her sister-in-law either. We found a bar and bought some lunch. Ek, the loud kid from the Netherlands, was here with his buddies. They were staying at San Nicolas but had walked into town for food, supplies, and, especially, drink. The Camino was a lot like this last time. We would see people on and off all along the Camino. Everyone was walking at different rates and I think we were constantly leap frogging each other. Right when you thought you would not see someone ever again ... they would appear. That night Gv made dinner. Our albergue mates felt ... not like pilgrims. They felt like tourist. They were nice enough but you could tell they saw this more as a vacation. This was especially true when they talked about getting taxis to skip undesirable stretches of the Camino. They were tourigrinos. There would be a lot of tourigrinos (tourist peregrinos [pilgrims]) this time around. Many more than last time. This is another way the Camino had changed. People were walking the Camino considering it a cheap vacation rather than a meaningful experience. I'm not sure I'm one to talk. The Camino is first and foremost a religious pilgrimage and I am a long way from being religious. I do consider myself spiritual though and most of the people I met last Camino also had, to some extent, a spiritual or religious motive. This time around I met fewer obviously spiritual/religious pilgrims. They were still there but the number of tourists, many inspired by the movie "The Way", was fairly large and the feeling of the Camino was changing ... moving in an uncomfortable direction. Iago's had a sore on his paw the past few weeks. 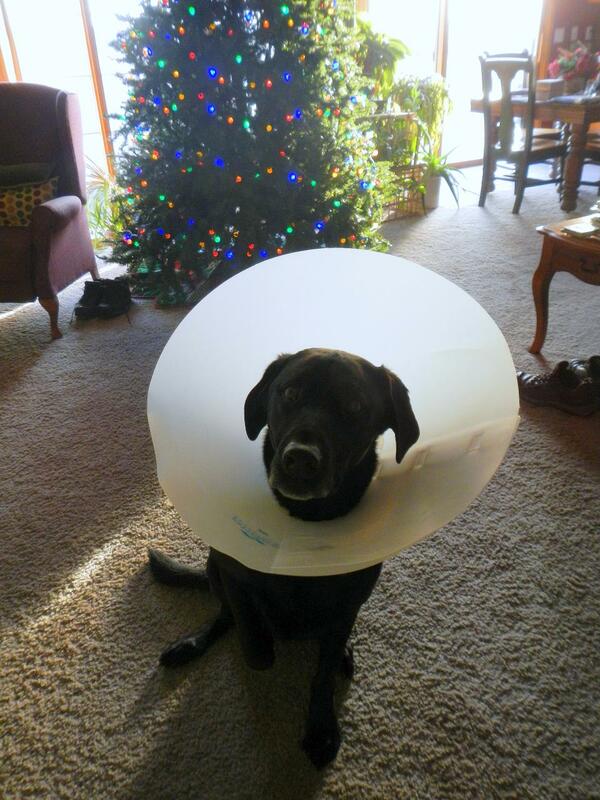 He's been licking it incessantly so he went to the vet this week. He was put on antibiotics, anti inflammatories, ... and the dreaded cone of shame. Can I get HBO with this thing? He's handling it pretty well. He does get it caught on things every now and then. The sore has improved over the past few days so I've been removing the cone when we can keep a close eye on him and keep him from licking it. Hopefully it will be off for good by next week. Note: If you don't understand the title of the post, here is a clue. We left Burgos in a drizzle. We stopped in a bakery and picked up a chocolate napoleon for an early breakfast. As we left town the drizzle slowly passed. This would not always be the case ... but I get ahead of myself. 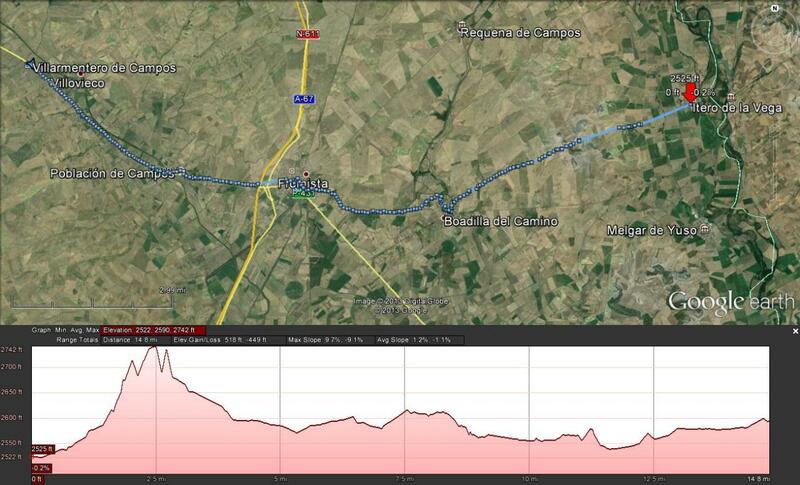 After Burgos is the start of the meseta. The meseta is relatively flat. Having said this it didn't feel as flat as last time. I'm not sure how to explain this really. I'm sure there is some psychological explanation. The fact that the weather was different and more overcast this time around may be some of it. Whatever the reason it felt hillier this time. We stopped in Tardajos and used the internet and got something to drink. We talked with a young couple from Texas that we'd seen a few times before. They'd worked on a boat to get to Europe and were an interesting couple. Why did the crustacean cross the road? 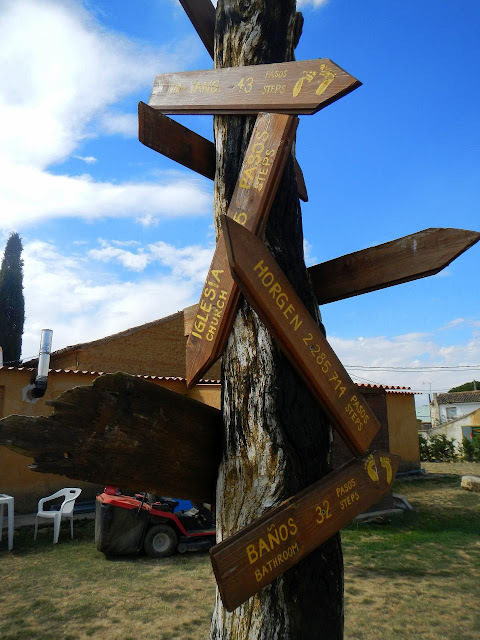 The next town after Tardajos is Hornillos del Camino which some people describe as 'a hole'. I'd skipped it last time and hadn't missed anything I think. This time we stopped and I bought a sandwich for lunch. We sat in a small church square surrounded by hundreds of flies. It was kind of disgusting. Eat - swat - drink - swat - swat - swat. I ate my lunch fast so we could get away from all the swatting. We passed a few people on the way including Ek who we hadn't seen in a long time (we'd met him way back in Cirauqui). He was doing well and was walking with a bunch of guys his age. He seemed like he was enjoying himself. Approaching the tiny and isolated San Bol albergue. Our destination of the day was a small albergue called San Bol. 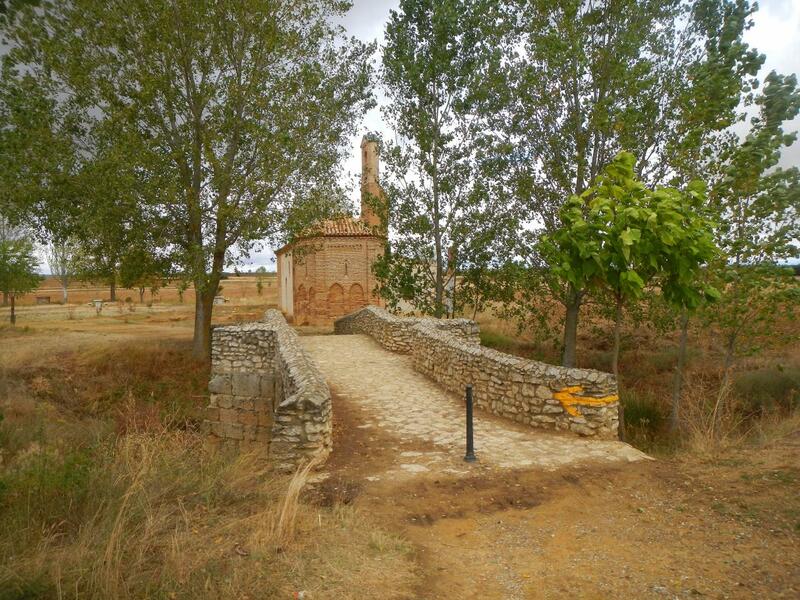 It is situated between Hornillos del Camino and Hontanas where I'd stopped last Camino. It's located out in the middle of nowhere. A single building on a small piece of land with trees and a natural, cold, spring. No town nearby. The land is surrounded by hay and wheat fields - it looks like an oasis in a desert. The albergue has twelve beds but they sometimes house more. When we got there it wasn't open yet. There were three other people here and we were four and five. Soon after two of the five moved on - the guy told us he would love to stay here but there was a woman ahead of him that he wanted to catch up to. We all smiled at that. The dome covered the albergue's dining room. I slept on the second floor. The other man there was from Massachusetts. Vn turned out to be a nice guy. We would run into him many times farther ahead and we would even walk with him a couple days on the way to Fisterra. Others showed up. Ma and Cm from Canada. Ce, a Mexican Spanish teacher who lives in Germany, and one of her adult students. A couple from Denmark, some Germans, and an Aussie named Ci. In the end we ended up with fourteen people in the small albergue. The albergues in Hornillos del Camino would fill up completely that night. I think Hontanas was full too. The hospitalera drove up just before the opening time posted on the door and let us in. We all did our chores and sat around outside enjoying the fresh air and the company. A tent pilgrim showed up and set up camp on the far side of the property. Camping was not permitted here but he sweet talked the hospitalera and she let him stay. He was traveling with this little white, cute, puff ball of a dog (Coco, I think its name was) - this explains why he was camping since albergues do not permit animals. 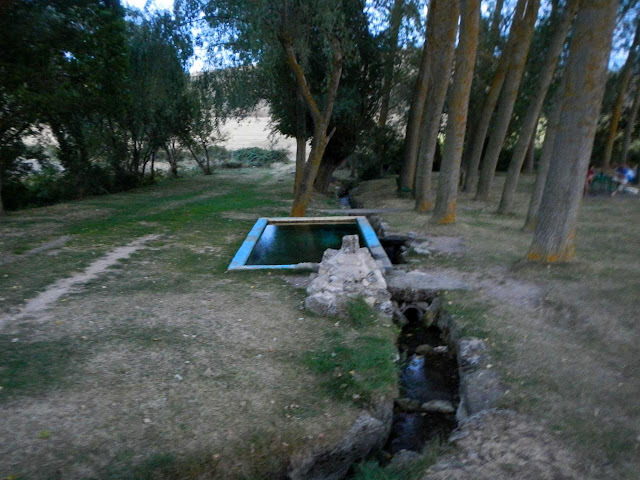 The natural spring on the property. The water was very cold. As the sun started to go down the hospitalera fired up the generator and cooked a large paella meal for us. The dinner table was a large round table in a small round room. It made talking to your fellow pilgrims easy. We went around the table and introduced ourselves and had a great time. The paella was almost finished by the end of the evening but the young German guy, who had walked the longest distance that day, just couldn't finished the last little bit no matter how much we encouraged him. We helped clean up after dinner, the hospitalera lit a candle in a lantern, turned off the generator, and said goodbye before she left. This felt so odd. I was so used to having supervision or at least the illusion of supervision. As the sun went down I went outside to see the stars. I hoped the isolation of San Bol, its distance from any town or city, would yield a brilliant field of stars. Sadly the drizzle we'd had this morning translated at this later hour as haze and the stars were only barely visible. A let down. Most albergues have a curfew. Albergue doors are often closed and locked by 10:00PM every night. 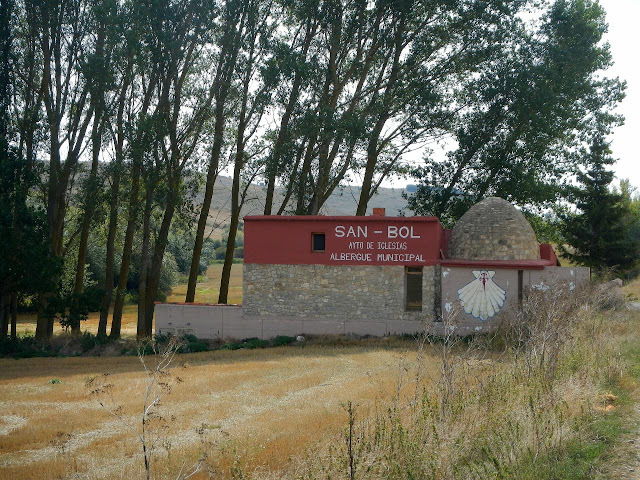 San Bol, without a hospitalera, had no curfew. Despite this, and the festive feeling - and wine - some people brought with them, everyone was in bed by 9:00PM. It was kind of funny really. San Bol turned out to be a nice place to stop. 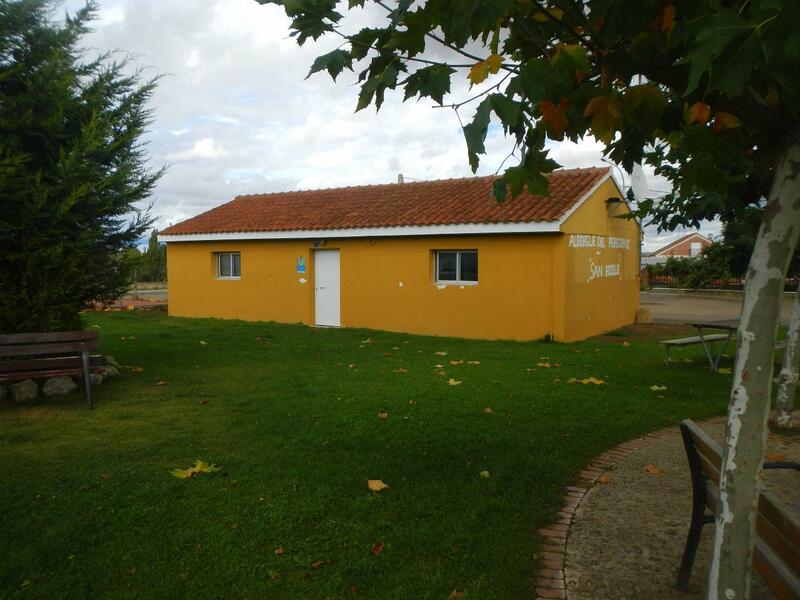 It had felt like a long day of walking and I was a bit worried about the rustic-ness of the place but it turned out to be a very comfortable place to stay the night and we met good people that we would encounter the rest of our Camino. Like Grañon, I would recommend all who can should spend a night at San Bol. It is a special place. A oasis in a sea of pilgrims. 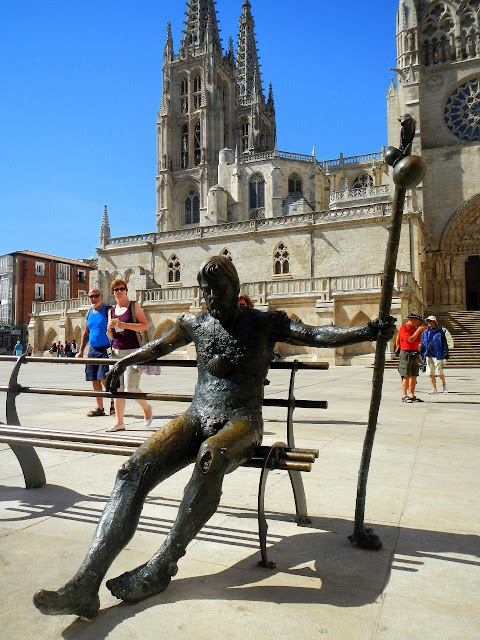 When I originally put together the tentative walking itinerary, I'd tried to skip cities like Burgos. Based on how we felt, the itinerary changed and we ended up stopping in Burgos. I'm glad we did. 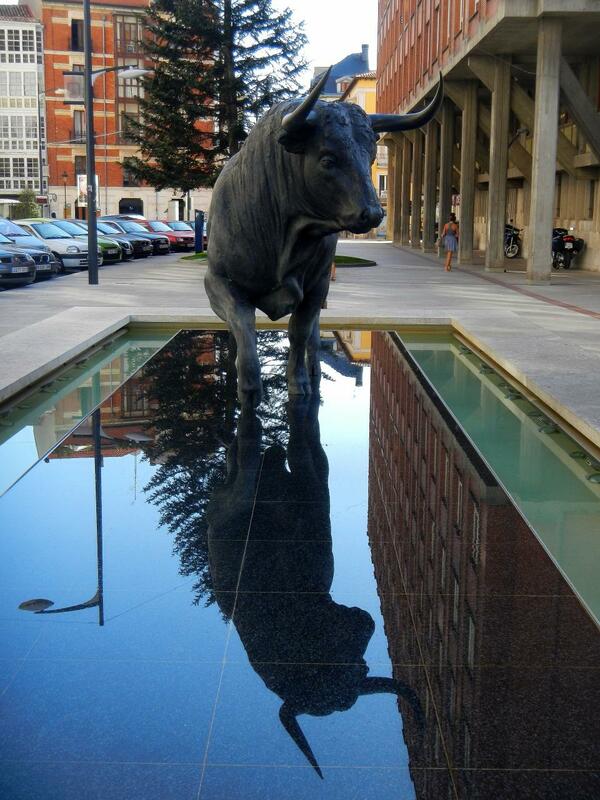 I like Burgos. It is a nice transition stop between the hilly first third of the Camino and the flatter meseta. The walk to Burgos was nicer this time around. I left later this time and there were no clouds and fog to obscure the view once you reached the top of the hill outside of Atapuerca. It wasn't all good though. For the past week or so we'd been fighting biting flies and mosquitoes. 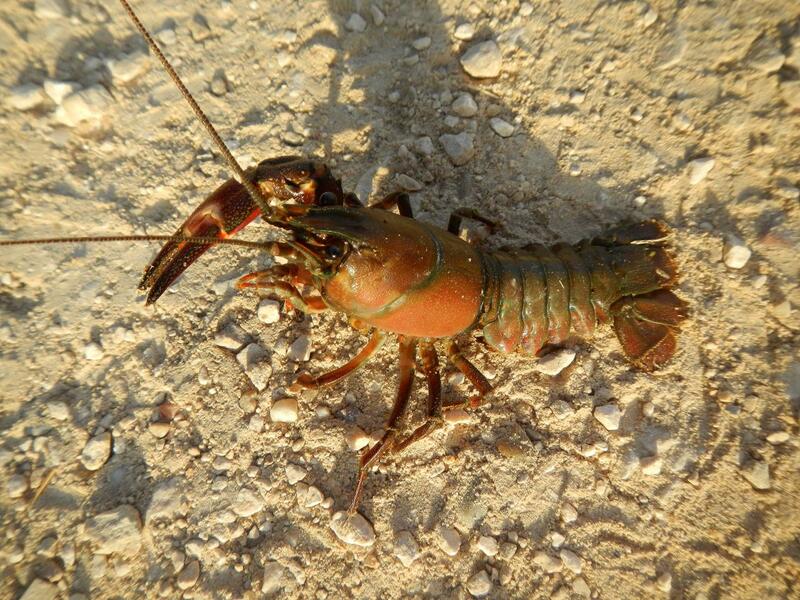 This hadn't been a problem last Camino but this time we were constantly swatting at our face and ears. 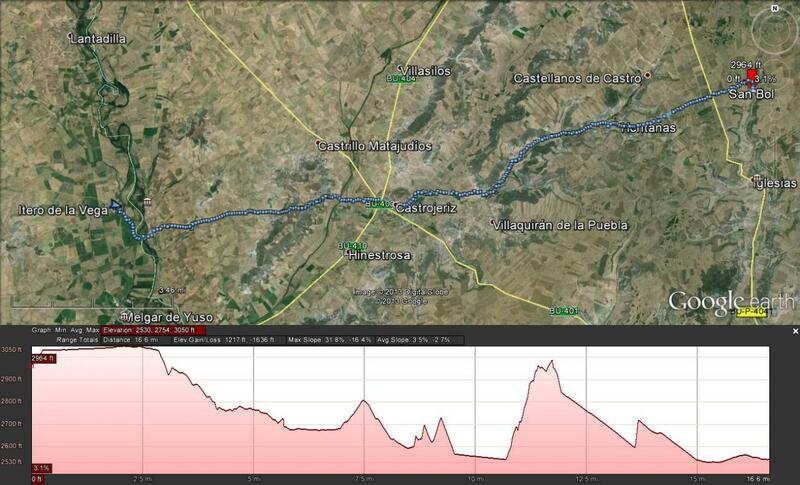 Top of the last big hill before Burgos and the start of the meseta. This being our second Camino, we were often asked about the route ahead and, when not asked, we often volunteered our advice anyway. For the past few days we'd been telling people how to enter Burgos. There are two ways: The industrial way and the more scenic, but less well marked, park way. I'd walked the industrial way last time and Gv had walked the scenic route. We told everyone we met how to take the scenic route. The industrial ways was miles of factories and commercial supply stores - not very inspiring - and I was looking forward to avoiding it this time. We reached the place where the two paths split. Gv looked at the sign and the distances and said "I would never had willingly added distance so this isn't the turn off." We walked on and before you knew it we were on the industrial way. While I was mildly disappointed it was also funny that Gv had missed the turn after telling everyone about it. Once you pass through the industrial area you enter the old center of town. I didn't remember a lot of this. I suspect they rerouted it slightly since the last time making it a more direct route to the albergue and cathedral. Or maybe my memory just played another trick on me. We checked into the albergue. We gave them our credentials but they did not stamp them. Unfortunately we didn't notice this until many days later. We would end up missing a few stamps for some odd reason. I felt like this some days but my knees looked better than this guy's. After doing out chores we headed out to find a pharmacy. I had to keep the promise I'd made in Tosantos to have my blister checked out. I talked to the pharmacist a bit and then pulled off the bandage. To my and Gv's surprise it didn't look nearly as bad as the day before. I described how it was being treated and the pharmacist agreed we were doing the right thing. I bought some more blister treatment materials (gauze pads, iodine, and hypafix [the best medical tape EVER]). I left the pharmacy feeling much better. Burgos has some cool statues like this bull in a reflecting pool. In a better mood, we wandered around the city and played tourist. 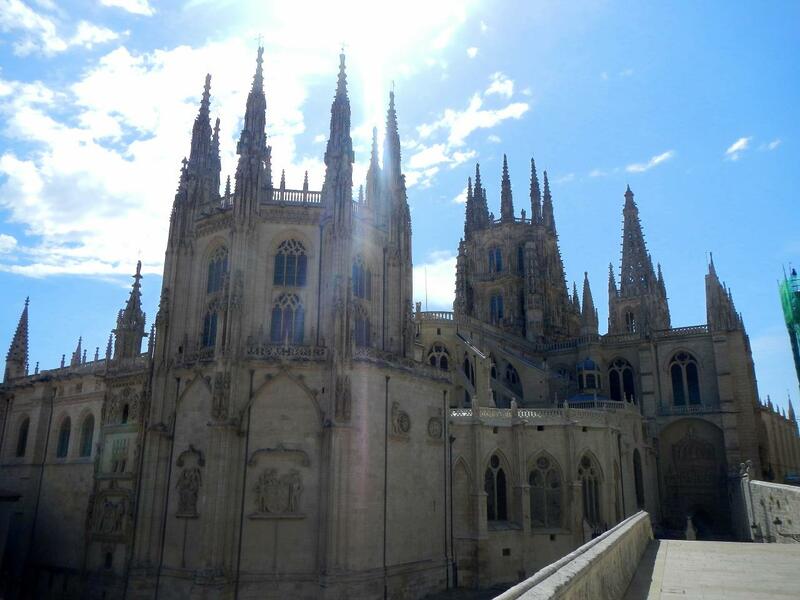 I really enjoy Burgos. I'd spent two days there last time letting my tendinitis heal and I remember it fondly. We ran into La and her sister (we met them in Torres del Rio) and we joined them for a drink. They were going to meet some people and eat at a rather famous vegetarian restaurant that everyone raves about. They asked us to join them. 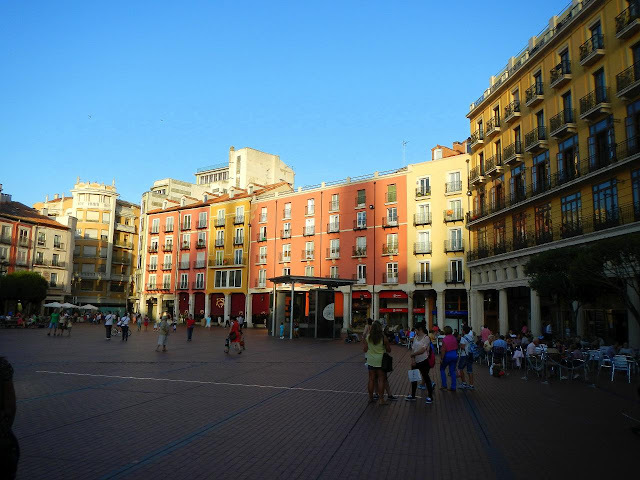 The nice square in Burgos with restaurants, bars, and cafes. The others arrived, including In who we'd met in Torres del Rio as well. They'd checked out the restaurant and found it was closed for vacation. We were a bit bummed so we headed to the central square and looked around for another place to eat. Someone suggested pizza and we found a recommended place on a side street off of the square. We enjoyed a good meal with fun people. Like last time, Burgos was a place of goodbyes. La and her sister were going home having reached the end of their time. In and a few others were taking the next day off. Gv and I were going to continue on as were a few other we'd met. We would meet other pilgrims, of course, but our second little family was breaking up (the first being the people we met on the Aragones). This was the norm this time: smaller, more ephemeral, families. I really like Burgos but I really don't like the goodbyes. People started to leave Tosantos really early. I guess everyone else felt just as weirded out as us. Sadly, there was one more bad thing left to happen. When the lights were turned on you could see the bugs crawling up the walls - they were bedbugs. Id both heard the stories of bedbugs on the Camino. Before I left home I treated my backpack, dry sack, and sleeping bag liner (what I slept in every night) with permethrin, a long lasting insecticide used by campers and hikers. Gv had done the same. I ended up with no bites. Gv was not so lucky and had bites on her arm and face ... parts outside her sleeping liner. Two other women had bites as well. I was lucky. I was sleeping right next to Gv. I guess she smelled yummier than me. 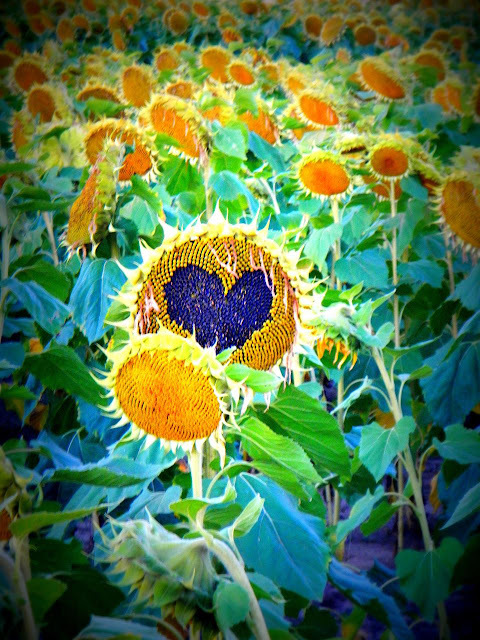 A sunflower ... with heart. After evacuating the albergue, and fighting that itchy feeling, we walked on. I was dreading this day. Last time I'd struggled crossing the Montes de Oca. I remember them as unending. Before we tackled this hilly stretch. we stopped in Villafranca Montes de Oca and ate some breakfast. We ran into a few pilgrims we hadn't seen since Torres del Rio. With renewed energy we left town and began climbing the trail. A message left along the way. Everyone I'd seen I'd warned about this stretch. It turned out to be a trick of my memory. This section wasn't nearly as bad as I remember. Things were in different order and seemed much shorter than last time. Gv agreed that it wasn't as bad as last time for her either. 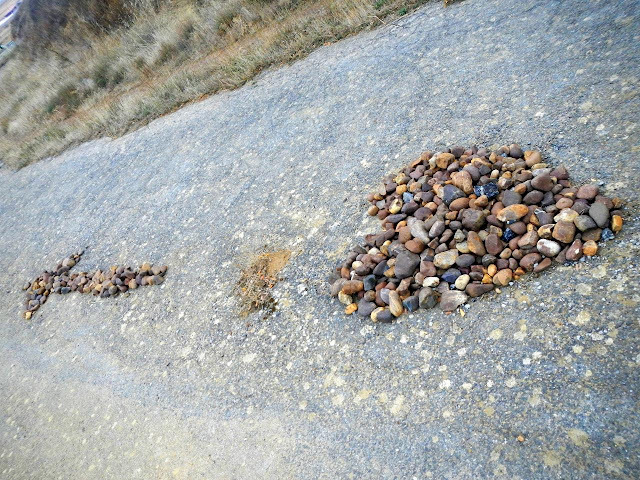 We decided the Camino had been improved along this stretch and possibly re-routed. It may have also been the nine days of hill climbing on the Aragones that had prepared us better. This would happen a lot along the way. Things that were hard before weren't. Things that were easy ... not so much. A splash captured in time. Agés, our stop for the day, is a nice town. It is obvious that they have geared the place to support pilgrims. There are good services and the people are friendly to the pilgrims. We checked into a nice albergue and we threw every piece of clothing except what we were wearing into a hot washer. We inspected our packs and found no signs of bedbugs. The itchy feeling started to fade. I took a nice nap this afternoon. My naps were not as deep and satisfying as last time. Not sure why but it might be the fact I wasn't taking as many painkillers. I still took the naps and they still felt good in the afternoon. I napped a lot on this Camino. More of the people we met in Torres del Rio showed up in Agés. It was nice to see some "old" faces. Everyone was having a good time it seemed. An older lady from the Netherlands (I think), who we'd met earlier on the way, was celebrating her 71st birthday. Sadly she too was suffering from bedbug bites. The low beams of the albergue. My head can tell you just how low they were - Ouch! The albergue was run by a married couple. The man ran the front office and the wife provided the evening meal. Tonight it was paella and it was delicious. The owner asked if anyone wanted more. A pilgrim said he would love a little bit more. The owner brought in a plate with a tiny little blob of paella. Strange looks went around and the owner started laughing. He was such a kidder. We all got a laugh. The albergue experience is made or broken by the attitudes of the owners and this guy seemed always happy. We thanked the wife for the wonderful meal and we went to bed with clean clothes. The bad memories of Tosantos faded like Gv's itchy bumps ... with time.